I’ve been making soap ponies this week. I love that I can use organic soap base and add fragrance using essential oils. 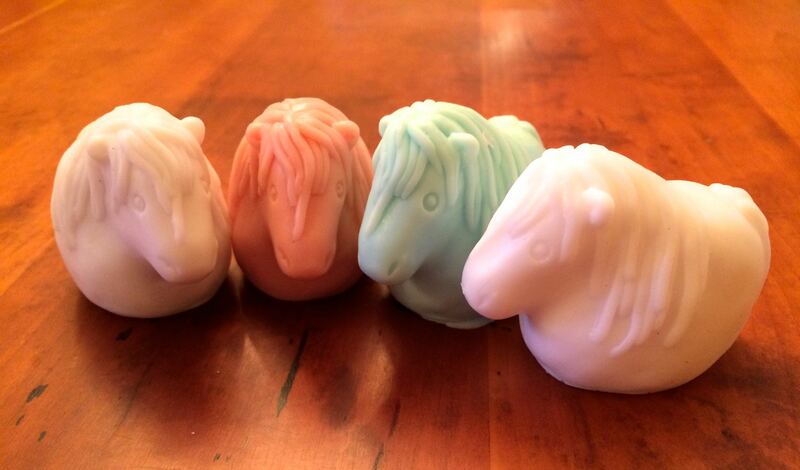 These ponies were made using a soap that has Shea and Mango butters in it. I have never had the urge to cast my own soaps, but when I saw this adorable mold, I decided to try my hand at it. It is fun! Now I have a growing herd of soap ponies. I’m thinking holiday gifts for my friends, items for the hunt club’s silent auction, and just filling my bathroom with them. They are just the right size to hold in your hand. For those of you who asked, I bought the silicone mold from GrandHorse on Etsy. The owner of the shop is an equestrian who makes her own molds. They are truly works of art! I love it! Hellooo, more details! These would be fun to make 🙂 I made soap some 13 years ago and it was all just some sort of “melty” glycerin mess. Did you buy a mix? Yes, I bought a melt and pour soap base and a silicone mold. I got them all on Etsy. Not messy at all — amazingly easy. I’m still experimenting with the different bases. My daughter and I make a real effort to use natural products without chemicals so this is a fun way to make this happen. Making soap from scratch generally involves using lye and that doesn’t interest me that much. Those are adorable!! They would make the perfect gift!